Zheng Pingping[郑萍萍], “After 159 Years, North Korea Participates in its First World Expo [159年后，朝鲜首次参加世博会],” China Youth Daily [中国青年报], May 1, 2010. Translation by Adam Cathcart. 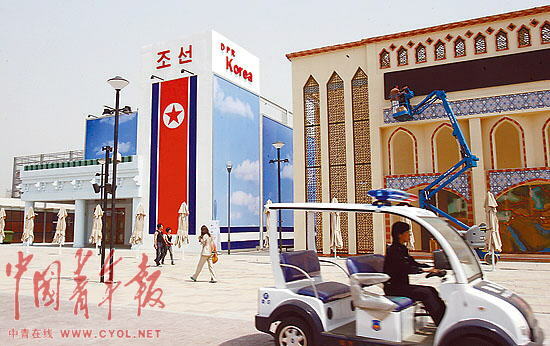 On April 30, the eve of the curtain-raising ceremonies, a site within the World Park district sits slightly quietly, the simple debut of a North Korean pavilion at a World Expo. Li Songyun [李成云], the Vice-Director of the DPRK’s Business Conference Office and the North Korean responsible for the pavilion, stands its entrance almost everyday, a smile on his face welcoming the crowds. “The World Expo is a happy occasion for China , and we are equally happy about this event as we would be about our own,” Li says. [This year’s pavilion marks] the first North Korean participation in the World Expo dating from the event’s inception in London in 1851. The North Korean pavilion has become the destination for many Chinese tourists, who, at peak times, need to queue [排队] for about half an hour. Li Jian, visiting Shanghai on his first day on a trip from Changzhou, bought a North Korean oil canvas, and afterwords sought out Li Songyun, wearing a Kim Il Song pin, to ask him the name of the painter. Li Songyun told China Youth Daily reporters that “DPRK-China friendship has a long history, and that Chinese in their 40s and 50s had heard songs from the [North Korean] film the “Flower Girl” so many times they could repeat them. Therefore [he went on to say] the Expo provided an excellent opportunity to give a little surprise to the people of Shanghai and the Chinese people to leave them with a good impression of present-day DPRK. North Korean pavilion staff member Kim Yinkui noted that the Chinese audience particularly enjoys taking photos in front of the “Tower of Juche Ideology [主体思想塔].” Using fluent Chinese, Kim introduced the Juche Tower by stating that it had been built to commemorate the 70th birthday of Kim Il Sung in Pyongyang, and was a tower 170 meters high. Like Li Songyun, he [Kim] also wore a Kim Il Sung badge, but pictures on the two men’s pins were different. On one video, one can see North Korean people celebrating the New Year by eating bean pancakes and New Year’s soup, leading a little friend/child to shout excitedly, “I also want to eat.” But for the male audience, clearly North Korean stamps are more interesting, with commemorative stamps priced at 20 yuan. More styles of stamps, however, stand as exhibits, and are not for sale. It’s a good translation. I‘m going to link to it on my site. My criticism would be that 朝鲜 doesn’t translate as the misnomer “North Korea”, it should rightly be rendered as Democratic People’s Republic of Korea, DPR Korea or DPRK. This is a very good point indeed. Something to think about in terms of finding the right balance between serving the Anglophone audience and being truthful to the original text. But Chaoxian itself isn’t “DPRK”… and until DPR Korea gets more standard (which perhaps it ought to be), maybe I will stick with North Korea. Anyway, more debate about this issue — as it deals with the rather important idea of how the DPRK is perceived in the West vs. as in China — would be helpful. Thanks again for the critique.